Acai Berry (pronounced ah-sigh-ee) has been a real sensation this year with many new products on the market promising everything from loss, antivirus properties and even help for people with Leukemia. Earlier this year Oprah put the acai Berry on the top of a list of superfoods and you know how things go when Oprah talks about them, the little Acai berry has not been safe since. To me the real story of the Acai Berry is that it is a fruit berry that has strong antioxidant abilities but lets see what we can find out about Acai Berry and your health. The acai Berry fruit, a small, round, black-purple fruit is about 1 inch in diameter, kind of like a grape and grows on a very tall tree. Two crops of fruit are pare grown per year. The Acai berry fruit has a single large seed that takes up a lot of the berry. The skin of a ripe berry is a deep purple color, or green, depending on the kind of acai that it is. The berries are harvested as food in the Amazon region of Brazil, acai palm (the tree it grows on) is incredibly important as it makes up a lot of the diet for the people in the area and is the biggest cash crop for it’s area of Brazil. The acai berry has been around for thousands of years and not until the 1990s was it introduced to North America. The Acai berry is thought to have tremendous health properties and was first used by the tribes of the Amazon jungle as a cure for various ailments. We all know how popular amazon reainforest fruits are for health, it is estimated that the tribes in Brazil usually use up to 2,000 of the 3,000 known rainforest fruits for medicinal purposes. Here is where history turns into science…..maybe. The acai berry was discovered to have great health properties by the people of the Amazon, such as a cholesterol controller and an antioxidant. The tribes of the Amazon knew of these properties and found out that it helped build the immune system, fight infection, protect the heart, and control prostate enlargement. It was a great energy food for the tribes-people. The acai berry is traditionally pulped to make wine that is rich in minerals. The acai berry was also discovered to fight schistosomosis, which affects more than 10 million Brazilians and is transmitted by snails. The acai berry is also used to produce an antibiotic that helps to fight against Staph infections, a common infection contracted mainly in hospitals. Most of the research to date on acai has focused on a particular freeze-dried form of Acai Berry referred to as Opti-acai. This powder preparation of freeze-dried acai fruit pulp and skin it has calcium, iron, and Vitamin A, as well as aspartic acid and glutamic acid. Acai has an exceptional content of fats, including oleic acid, palmitic acid, and linoleic acid, and also contains a high amount of beta-sitosterol. These oil compartments in acai fruit harbor dense contents of polyphenols, much like Green Tea such as procyanidin oligmers and vanillic acid, syringic acid, hydroxybenzoic acid, protocatechuic acid, and ferulic acid which were shown to degrade substantially during storage or exposure to heat, so keeping acai berry or cooking it is difficult. A powdered preparation of freeze-dried acai fruit pulp and skin was shown to contain anthocyanins, antioxidant capacity of acai is about 10%. The powdered preparation was also reported to contain twelve flavonoid-like compounds, including homoorientin, orientin, taxifolin, deoxyhexose, isovitexin, scoparin, as well as proanthocyanidins, and low levels of resveratrol. In a study of different acai varieties for their antioxidant capacity, a white species displayed no antioxidant activity against different oxygen radicals, whereas the purple variety most often used commercially was excellent against peroxyl radicals, good against peroxynitrite and poor against hydroxyl radicals. Freeze-dried acai powder was found to have high antioxidant activity against superoxide and peroxyl radicals and milder activity for peroxynitrite and hydroxyl radicals. The powder was reported to inhibit hydrogen peroxide-induced oxidation in neutrophils, and to have a slight stimulatory effect on nitric oxide production by lipopolysaccharide-stimulated macrophages in vitro. Extracts of acai seeds were reported to have antioxidant capacity against peroxyl radicals, similar to the capacity of the pulp, with higher antioxidant capacity against peroxynitrite and hydroxyl radicals. When three commercially available juice mixes containing unspecified percentages of acai juice were compared for in vitro antioxidant capacity against red wine, tea, six types of pure fruit juice, and pomegranate juice with added antioxidants, the average antioxidant capacity was ranked lower than that of the antioxidant enhanced pomegranate juice, Concord grape juice, blueberry juice, and red wine. The average was roughly equivalent to that of black cherry or cranberry juice, and was higher than that of orange juice, apple juice, and tea. Studies have demonstrated that blood antioxidant capacity increases within two hours of consuming a commercial acai juice. Acai berry has 15-20 times the antioxidants (anthocyanins) that red grapes have. Combined with proper diet and exercise, the acai berry can be an good for weight loss. Its natural combination of antioxidants, essential fatty acids, amino acids, phytosterols, and amino acids work together to help your body function better, process food easier, and burn fat more efficiently. Acai Berry boosts your metabolism thanks to the Omega Vitamins and reportedly suppresses appetite as well because of it’s high fiber content. 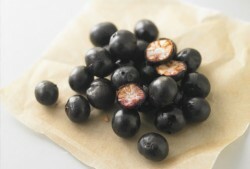 The juice and pulp of acai berries are frequently used in various juice blends. In northern Brazil, acai is traditionally served in gourds called “cuias” with tapioca and, depending on the local preference, can be consumed either salty or sweet. Acai has become popular in southern Brazil where it is consumed cold as acai na tigela (“acai in the bowl”), mostly mixed with granola much like we would have cereal here in North America. Also in Brazil you can buy Acai Berry flavored ice cream and juice. Several companies now manufacture juices, health drinks, yogurts, and sorbets made from acai berries, often in combination with other fruits. Will Acai Berry help you lose weight..really? Well with all of the information and a few studies under it’s belt Acai Berry seems like a promising superfood. Really the way that I look at Acai Berry as that it is a great antioxidant like a lot of fruits are, maybe more so even and the fact that it is high in fiber is going to help you feel more full. I think that if you want to experiment this is a really great food to try out. The fact is that many natural remedies are really great for loss but more so even for improving your health mostly from a whole food kind of perspective. Again, if you try this out let me know how well it worked. I would be interested in seeing some acai berry success stories and if you feel no change to your health let me know as well. I am a firm believer that it works. Go get it. Take action and change your life. I have been an Aromatherapist for thirty years now and have had many clients with fatty cysts on their body’s over the years. I have one client who is a very fit man, but he has suffered from fatty lumps on his body for 20 years or more. Last week he came for a treatment and I noticed that most of them had disappeared, I asked him had he been on a detox or anything and he said no he hadn’t . The only difference to his diet had been that he had been taking Acai for a couple of months. I was staggered by the fact that nearly all of the cysts had gone, needless to say I have started taking it myself and will encourage my other clients with fatty cysts to take them as well. I am really excited about the qualities of Acai.